It's 5:50am and I'm heading down Taylorsville Rd. to the gym when I notice a bunch of debris on the sidewalk. As I get closer, I can see that it's a mangled bicycle, a car bumper, and other assorted items. I pull over for a closer look. The rear wheel of the bike has been bent completely in half, the derailleur is hanging loose, the fabric of the seat is in tatters. On the ground next to the bike is a gray t-shirt covered in dirt, grime and holes. The shirt has been cut up the back with scissors. 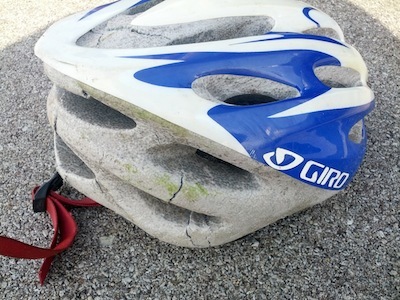 An intact bike helmet lays next to the bike. There are plastic wrappers everyone for bandages and a cervical collar. A giant chunk of car bumper is in the grass about 6 feet away. The bike appears not to be a total loss so I toss it in my car. Later, I hope, I'll track down the owner and get it back to them. All in all, a dark start to the day.